This chapter is a deep outburst! 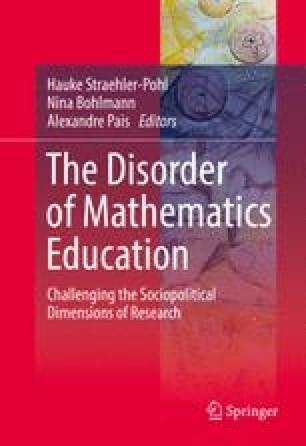 This outburst first materialized as a presentation during a small international meeting of mathematics education researchers—DOME (Disorder of Mathematics Education), in early 2015 in Berlin. Mathematic education researchers committed to Critical Social Theory made up the core participants at the DOME. The central aim of this chapter is to propose some thoughts regarding our situationality as critical researchers and considering the position that our research occupies in the capitalist wile. The systematization of the presented arguments came as a result of a reflexion on my recent path as mathematics education researcher and educator, self-labelled as critical. The discourse begins with a brief introduction of some points of view over our choices, questioning our freedom, going through the political flows of our survival, and enquiring the role of our production, reproduction, and contradictions as critical researchers—passing to another stage as critical researchers. Lia Laporta, Liz de Freitas, David Swanson, and Alexandre Pais … thank you very much for the discussion times! Special thanks to Hauke Straehler- Pohl for the warmth and professionalism with which he edited this work. This chapter was developed in the context of Post-Doctorate in Science Education, funded by the Fundação para a Ciência e a Tecnologia, under internal identification: SFRH/BPD/87248/2012. Balibar. E. (2010). Europe is a dead political project. In The Guardian. Retrieved May 25, from http://www.theguardian.com/commentisfree/2010/may/25/eu-crisis-catastrophic-consequences. Tragtenber, M. (1990/2002). Sobre Educação, Política e Sindicalismo. In Revista Espaço Académico, Ano II, n° 14. Maringá: Universidade Estadual de Maringá Ed. http://www.espacoacademico.com.br/014/14mtrag1990.htm. Žižek, S. (2001). Lenin’s choice. In Repeating Lenin. Lacan.com. http://www.lacan.com/replenin.htm. Žižek, S. (2010). The end of nature. Retrieved December 2, from http://www.nytimes.com/2010/12/02/opinion/global/02iht-GA12zizek.html?_r=0. Žižek, S. (2014). O Guia da Ideologia do Ódio. Retrieved November 4th, from http://vimeo.com/110715167.